The sun said officially goodbye to me as a Dutch person. Sunlight is going to be rare during the winter months and the cold and windy days are here. To make these dark days a little bit better, I try to lit up a candle every night when we sit on the couch or when I head over to my bed. 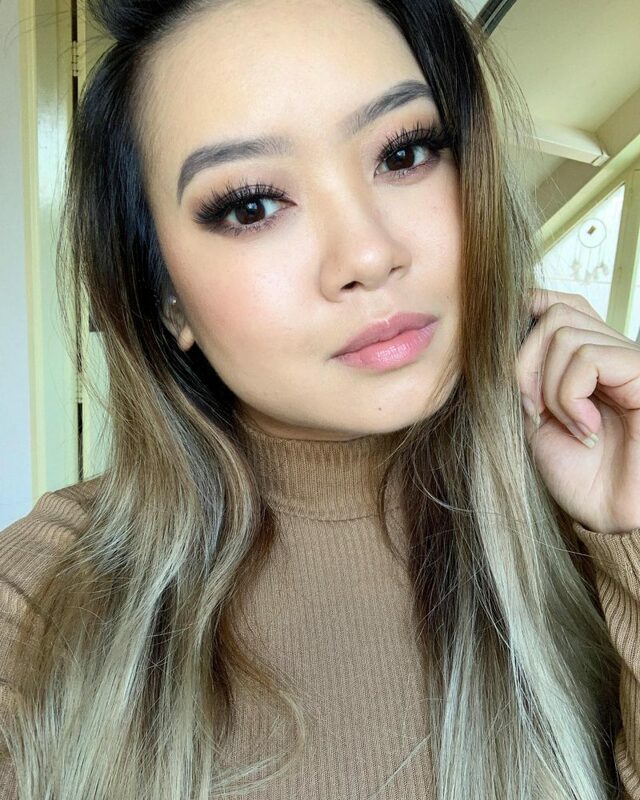 My dear friend Lipsonfire shared an Instastory where she showed her WoodWick candle and I was immediately sold! I had to try it myself after she said that this candle will make a crackling sound when you lit up the candle. Say what? This candle has a wooden wick, which creates the fireplace sound. I was looking for a cozy but fresh fragrance, that’s why I picked up Baby Powder. Curious how to survive this winter? 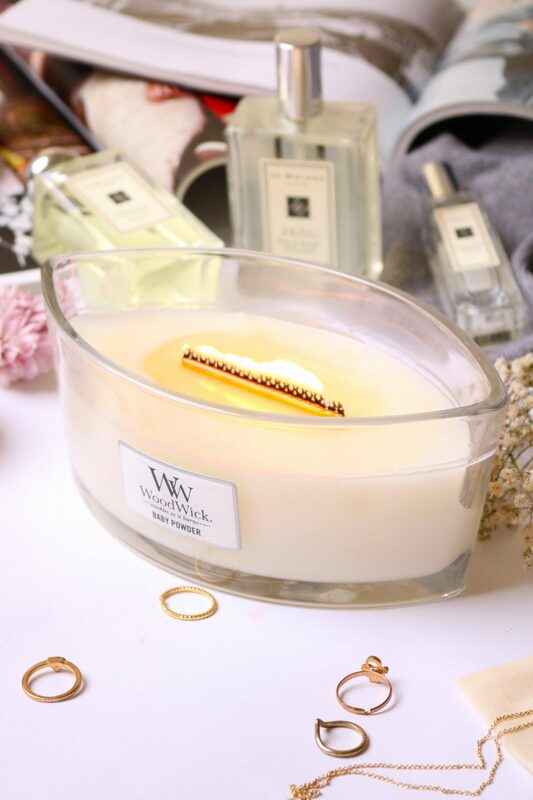 When you are looking for a cozy and nice fragrance that creates a warm vibe in your living area, than WoodWick is what you are looking for. 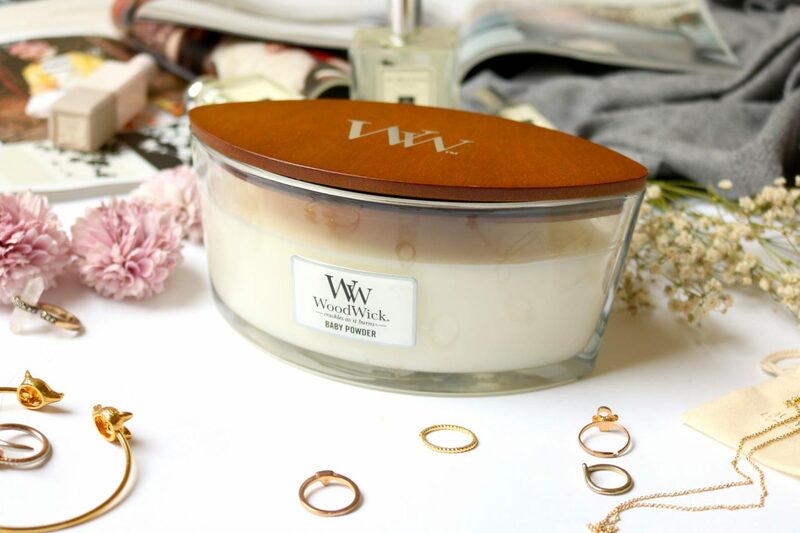 The difference between WoodWick and other scented candles is that the wick of made from wood, which creates a crackling sound when you lit it up! First I couldn’t believe it when my friend Melanie from Lipsonfire told me it. She sent me a voice message of the candle that was burning and it really made a crackling sound! Just like you are sitting next to a fireplace. They offer different sizes of candles bit the one I have is the biggest they have. This one in particularly has a long wooden wick which almost look like a real fireplace. The other ones have a regular size wick, but still made out of wood. The size of the candle is huge! 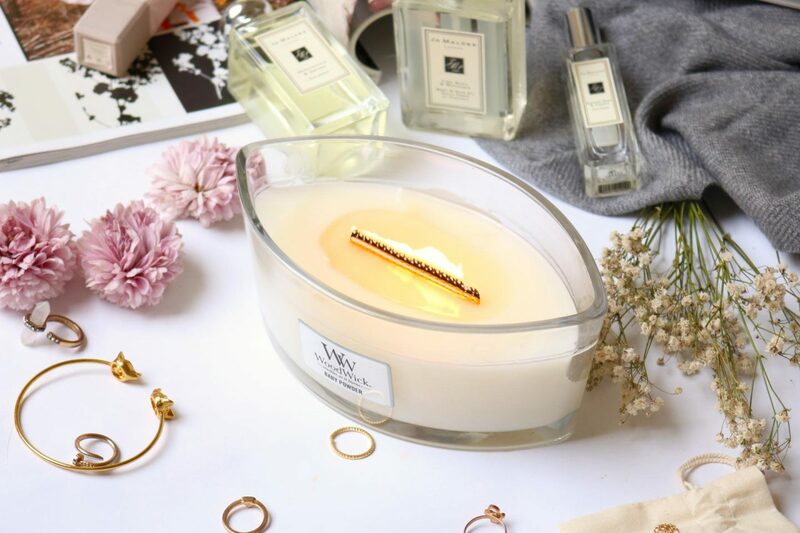 It is almost 500 grams with the glass, so you will have enough time to enjoy this candle. On top you will find a lid that is made out of wood which has the initials “WW” printed on it which stands for WoodWick ofcourse. Be careful because it is heavier than you thought. I have a glass salon table and I almost made the mistake to drop the candle on the table. Oops. When you remove the lid you can instantly sniff the Baby Powder scent. You can find this long wooden wick in the center on the candle, which creates a cozy flame and crackling wood sound. I picked the scent Baby Powder because I was looking for a fresh fragrance that could fit with every kind of occasion. They have tons of other fragrances that vary from simple ones like Coconut, Fig and Linen to White Willow Moss, Woodland Shade and At The Beach. I prefer a more classic scented candle because my dad has a very sensitive noise and might get a headache if the scent is too strong. I once made the mistake to buy some super strong scented stick for in the living room and they ended up being in the toilet. Usually when it comes to perfumes I like a more romantic intense scent, which is totally the opposite of Baby Powder. I expected Baby Powder to be more soft and fresh, because I also use scented kitty litter with baby powder. It was not really what I expected. The scent was great the first 10 minutes, but quickly after that I got a huge headache. Not only me but my little sister also thought that the candle was overpowering the living room. I only had the candle on for maybe 30 minutes, but I think that is also the max that I will lit on the candle. Within 30 minutes the first layer of wax is already melted. I turned of the wooden wick so the melted wax could cool down but still spread the Baby Powder scent through the living room. 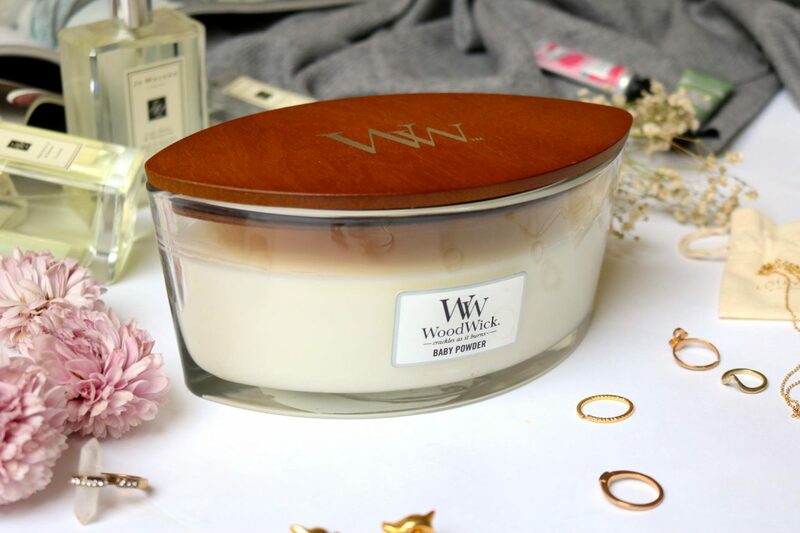 The wooden wick is the most exciting part of the candle! I used a big lighter to turn on the candle. If you lit it up for the first time make sure to go from left to the right to turn it on. If you lit it up on only one side the wick might won’t turn on well. The moment when the wick was fully on fire it felt like a mini fireplace! The flames looked amazing and the crackling sound was so loud that my cat Lilo even took a look what that noise was. My dad could only shake his head when he saw the candle. “It is so big!”, he said. Oh well, that’s what they all say right? I’m sold! 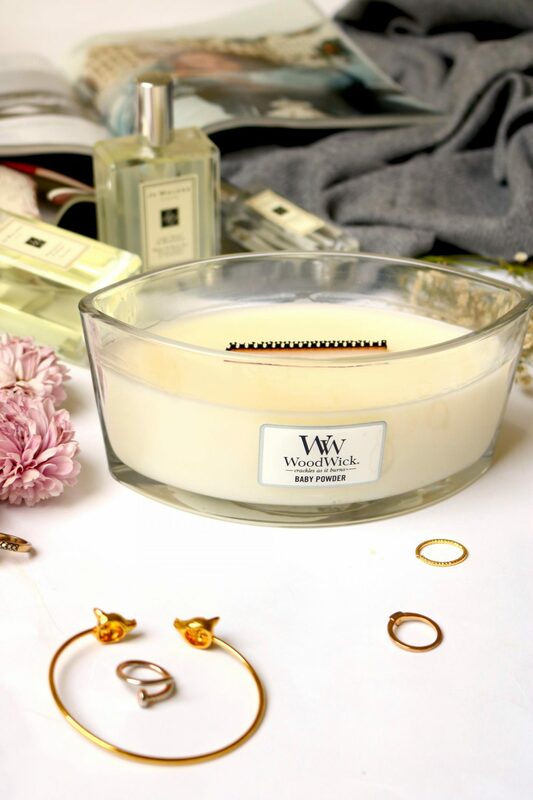 The WoodWick candles are more affordable than Diptyque and ByRedo and even have this amazing crackling effect. I do have to say that the glass container isn’t that pretty as other brands, but at the end it is about the scent and the experience. I definitely will buy more of the WoodWick candles, I have my eyes on Cinnamon Chai and Coastel Sunset. Melanie’s favorite is Coastel Sunset so I’m really curious if I also will love it as much as she does. I won’t repurchase Baby Powder because the scent is quite overwhelming and I prefer a more warm scent. Which scented candle is your favorite during the winter months? 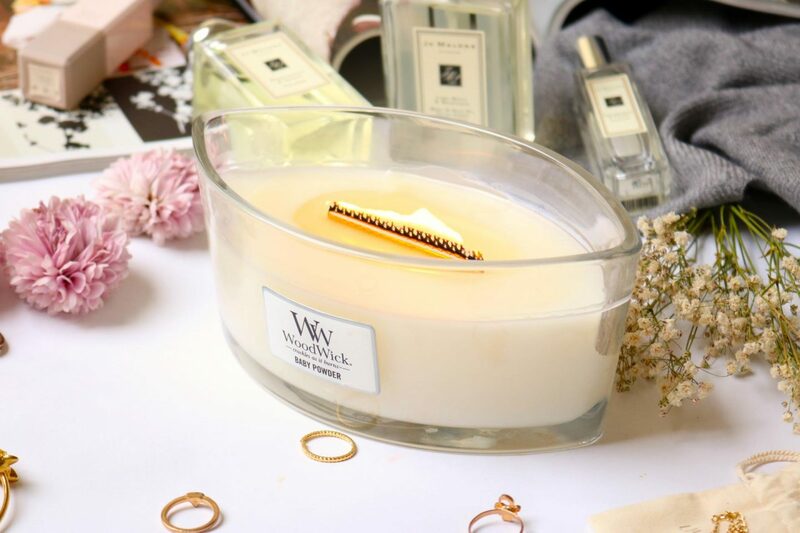 Get your WoodWick candle here on Notino.nl. Baby Powder is currently sold out, but you can always sign up when they are back in stock!